THE BASICS: A high quality bottle and pill holder with a large capacity of 730 ml. The bottle comes in clear with a white lid and pill tray. The lid screws on and offers a degree of protection against leaking. CONVENIENT: The bottle is shaped like a pill with smooth curves; measuring 23 x 7 cm this can easily fit in a bag and in some pockets. 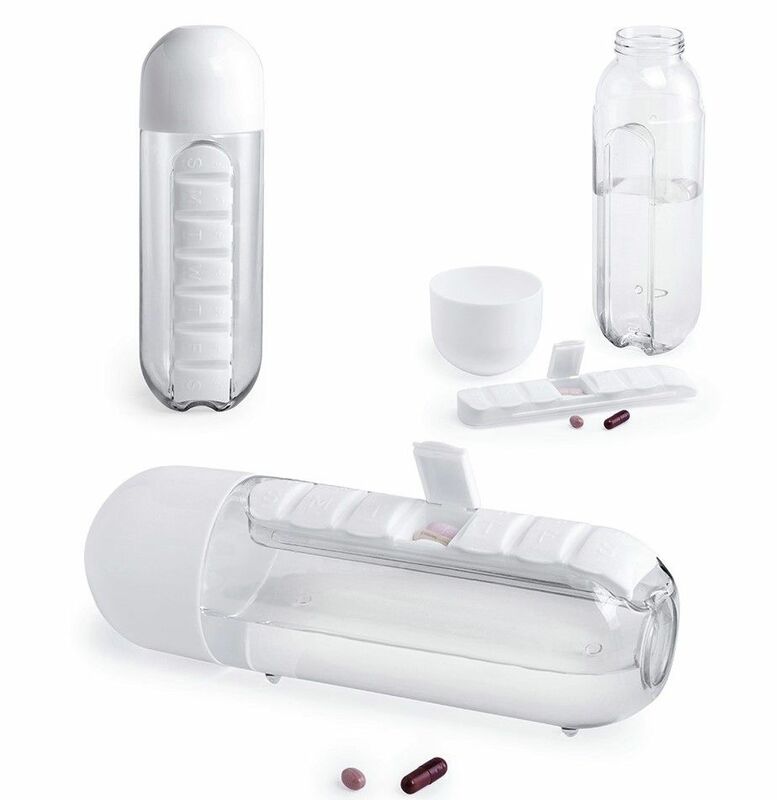 The pill tray can slide out from the side of the bottle making it easy to wash, and if you want to use the bottle without the tray this is also achievable. The bottle has little plastic feet on one side so you can easily prop the bottle whilst using the tray. UNIVERSAL: The pill tray features 7 different compartments, theses are identified with the days of the week. You will find the letter for each day on the lid, the day in French as well as braille. The compartments open and shut with a click. 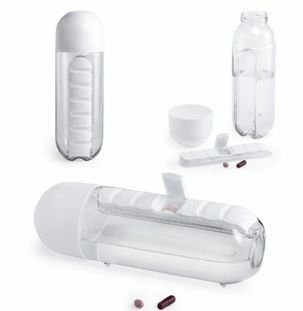 SMART DESIGN: An ingenious invention this bottle allows you to take pills easily when on the go. Whether travelling abroad or on a day trip you can keep the essentials close; equipped with the water bottle you also have access to fresh water throughout the day. The lid also double up as a cup, due to its unique design it is rounded towards the bottom where it is flat meaning you can place this on any flat surface. ECO FRIENDLY: The bottle is constructed from BPA free plastic, this makes the bottle reusable saying goodbye to bottles that have one use and cause great damage to the environment. This Tritan bottle ensures a long lasting bottle with a multitude of uses.